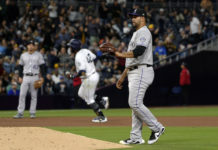 The Colorado Rockies downward spiral continued over the weekend as the club was swept in two games by the Los Angeles Dodgers at Coors Field. The Rockies have now lost nine straight contests – all to NL West opponents. They went winless in their four-game, weather-shortened homestand. 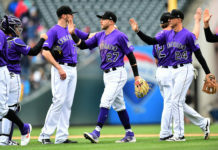 The second game of the series was postponed on Saturday as Coors Field was blanketed in four inches of snow. The first game of the series was cut short after just six innings on Friday due to inclement weather. Adrian Gonzalez continued his hot start to the season by going 5-for-7 at the plate with five RBIs and two doubles on the Rockies over the weekend. The powerful first baseman leads the MLB with 29 RBIs this season. The Rockies’ pitching staff combined to walk 14 batters in just 14 and one-third innings. Their starters accounted for 10 of those walks and pitched just nine and one-third innings. Brett Anderson (2-1) shut down the Rockies offense as the Dodgers squeaked out a one-run victory in a weather shortened series-opener. The game was called after just one out in the top of the sixth inning. 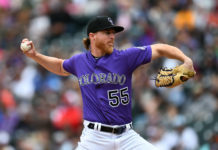 Anderson held the Rockies to six hits and one run (unearned) in five innings before having his day shortened by the weather. Eddie Butler (2-3) was working on a decent performance as well. He allowed two earned runs on five hits in five and one-third innings. The righty allowed four walks with three strikeouts. The Dodgers jumped out to a 2-0 lead in the first inning on an RBI double by Gonzalez and a sacrifice fly by Yasmani Grandal. Butler walked two of the first three batters he faced and they both ended up scoring. The Rockies scored their only run when Troy Tulowitzki crossed home on an error by Dodgers left fielder Alex Guerrero. Justin Turner broke a 5-5 tie in the eighth inning with a two-run homerun as the Dodgers came from behind and ran away with a win and the series Sunday night. Turner, 30, already has four homeruns in the month of May. The win marked the seventh consecutive victory over the Rockies for the Dodgers. The Rockies lost the game despite tagging Clayton Kershaw for five runs and leading by as many as three runs. Last year’s NL MVP had an uncharacteristically poor day – allowing eight hits and five runs with four walks in five and two-thirds innings. He was hit around in the fourth inning. Wilin Rosario looked solid, both at first place and on offense, in his first start since being recalled from triple-A Albuquerque. He went 2-for-3 with an RBI single. Nick Hundley extended his hitting streak to 12 games in the loss. Jorge De La Rosa was equally poor on Sunday night. The veteran lefty allowed five runs on five hits with six walks in just four innings. De La Rosa’s ERA ballooned to 9.56. The Rockies’ ten walks in the game were tied for the most by any team in MLB this season. 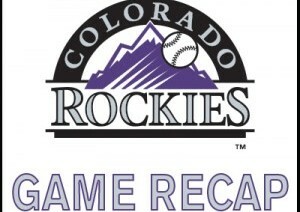 Gonzalez ripped off a three-run double in the fifth inning to erase a temporary lead for the Rockies. He added a sacrifice fly later in the game to complete his second four-RBI game of the season.